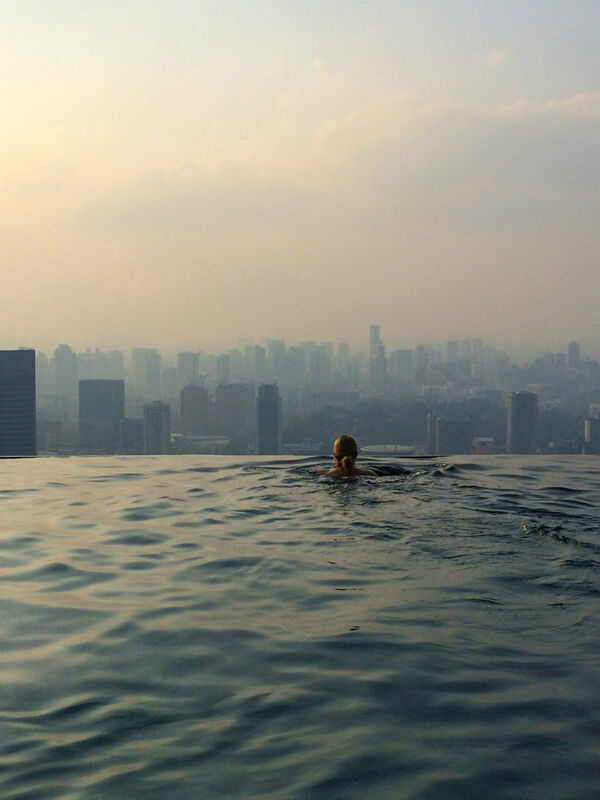 Singapore! On our way to Australia we make a week’s stopover here before continuing on to Brisbane. I fell in love right away! 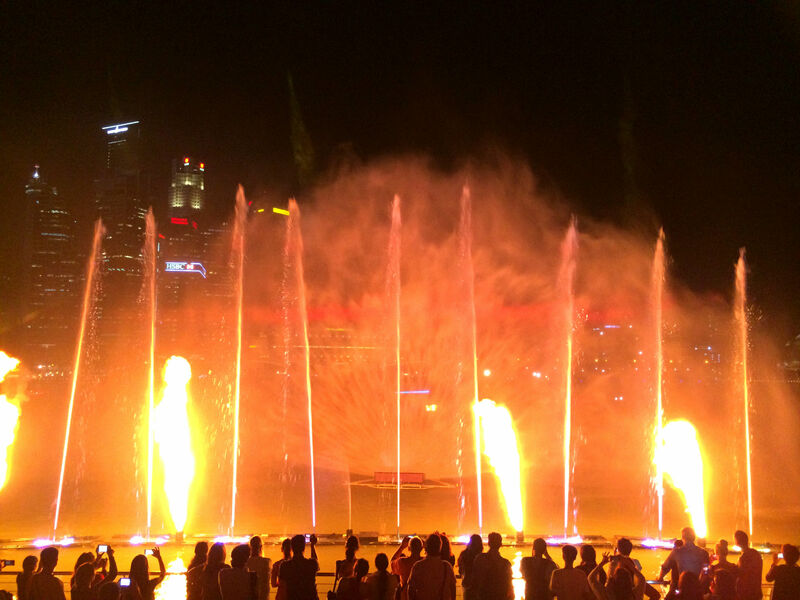 Singapore is diversified, colorful, clean, friendly and offers so many attractions. 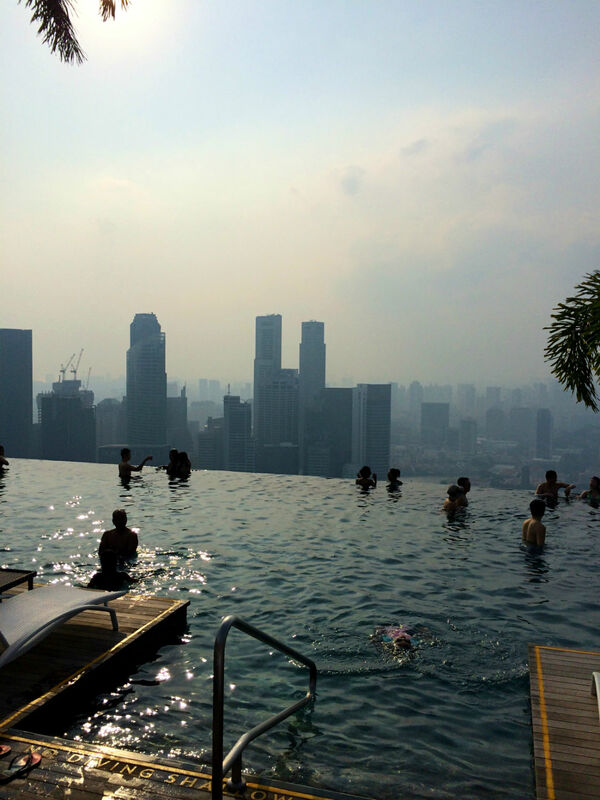 An absolute highlight and trademark of the city is the imposing Marina Bay Sands Hotel. 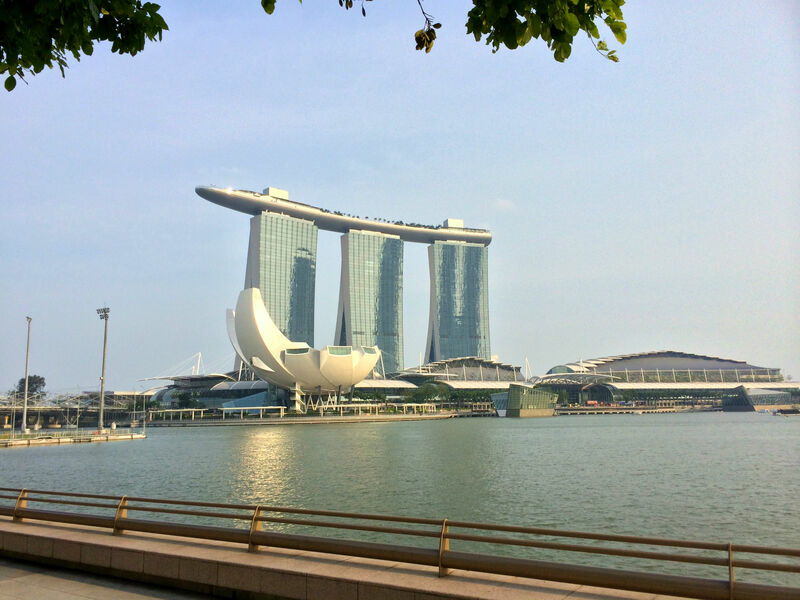 Lovingly also called “ironing board”, it stands at Marina Bay and dominates the cityscape. 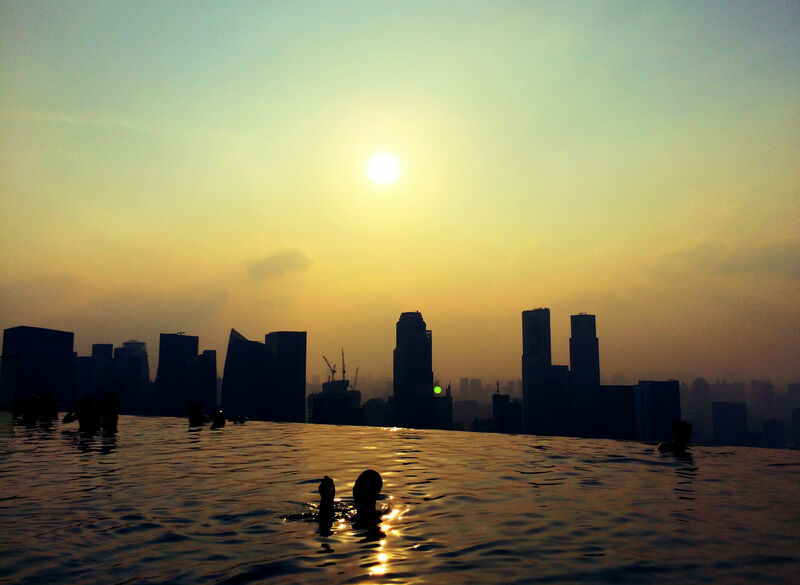 The first five days of our Singapore stay we were on the go from morning till night, exploring the city. 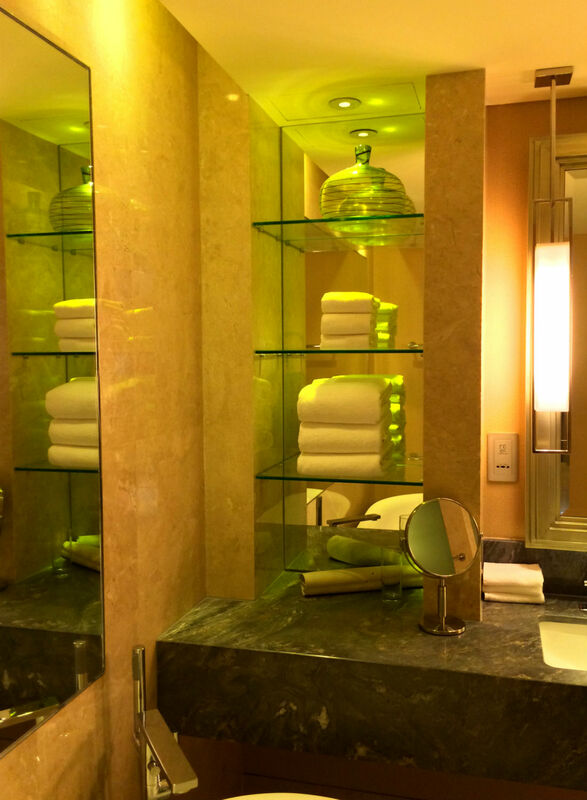 For this purpose a “normal” hotel was completely enough. 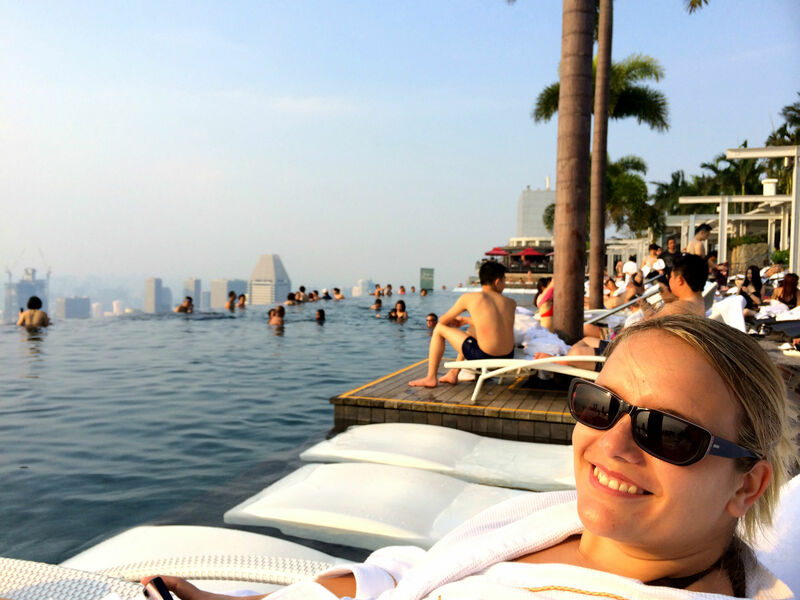 The last two days, however, we set aside for the famous Marina Bay Sands Hotel and treat ourselves to something special. Upon entering, the lobby is boisterous with activity. 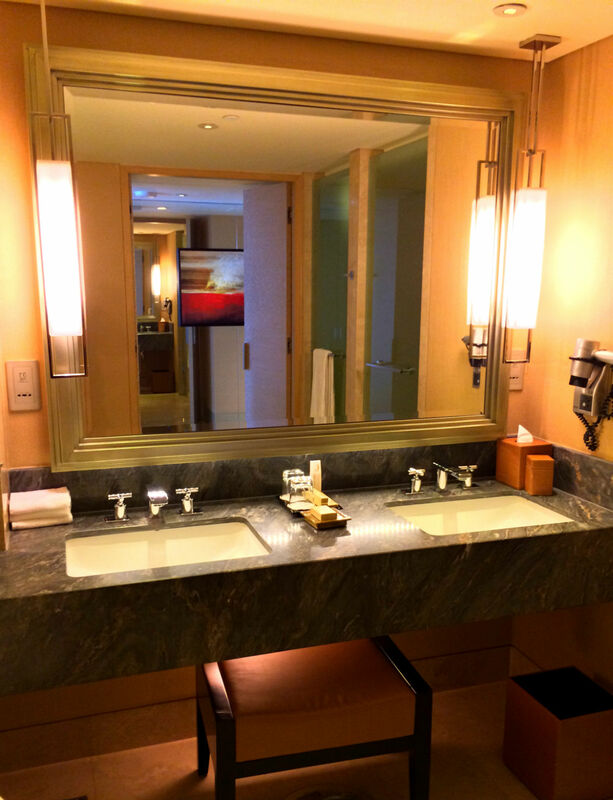 Many people do the same as we have, booking only one or two nights in the hotel. 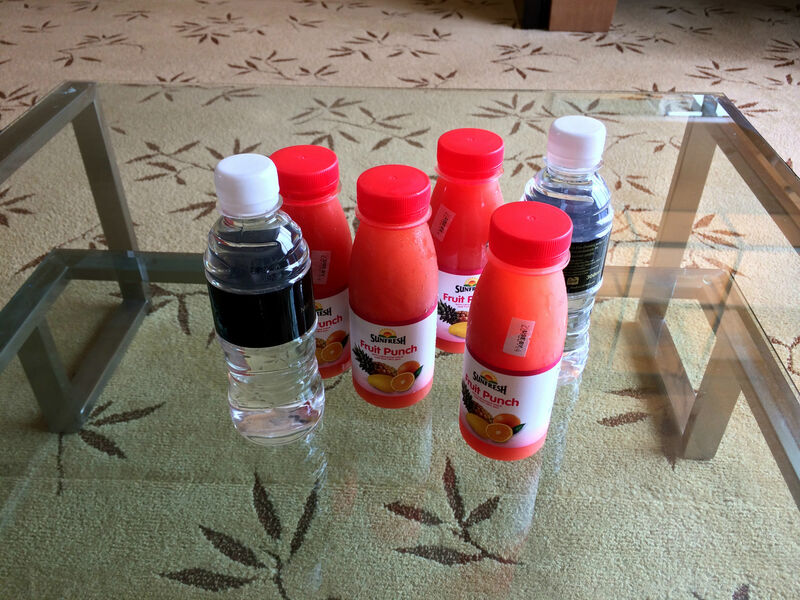 However, check-in proceeds rapidly and we are well supplied with water and fruit juice. 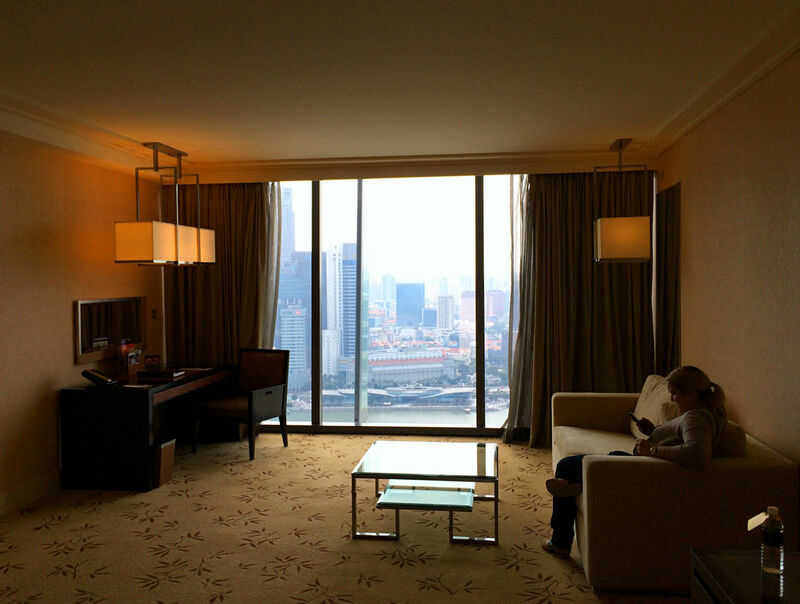 We booked a Deluxe Room with City View. If you chose this option, at a small extra charge, you get a room on the 19th floor or higher. Our room is on the 41st floor. The view is a dream! 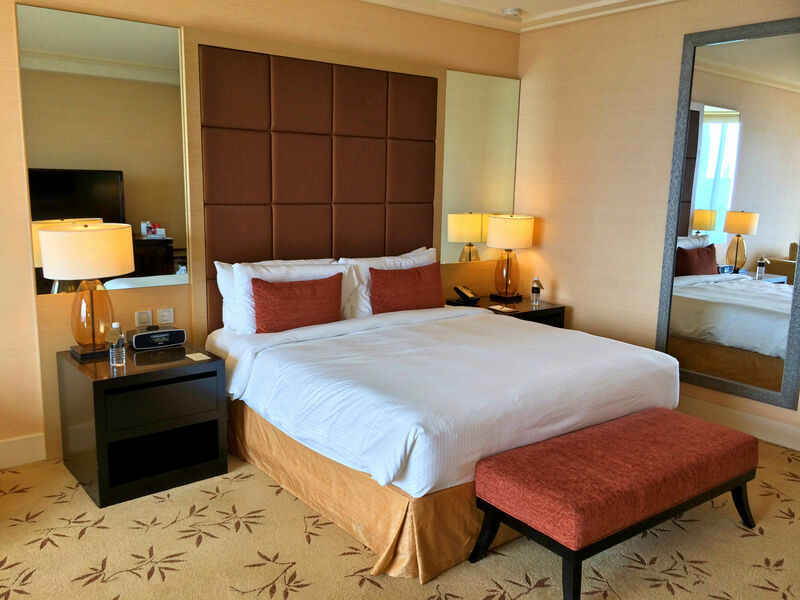 The Deluxe Room is 40 square meters, decorated in natural colors and has a floor to ceiling window front. 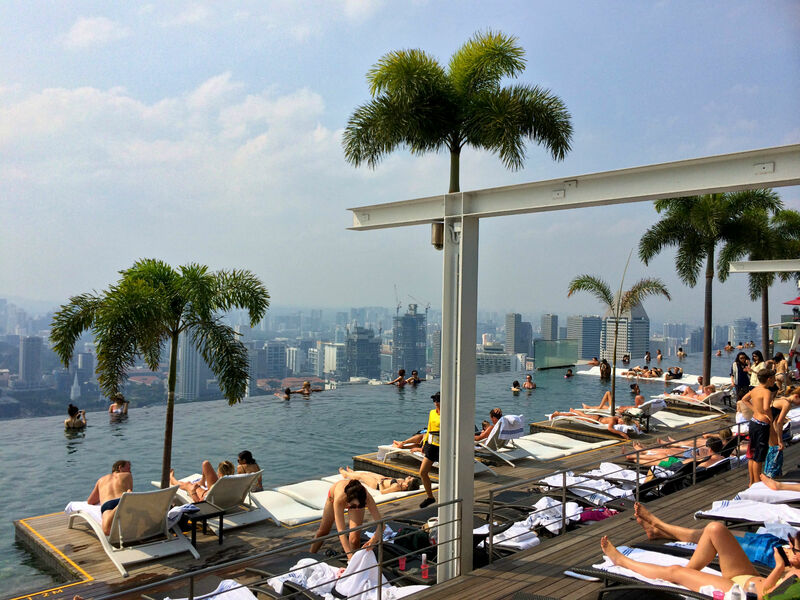 The view is breathtaking! 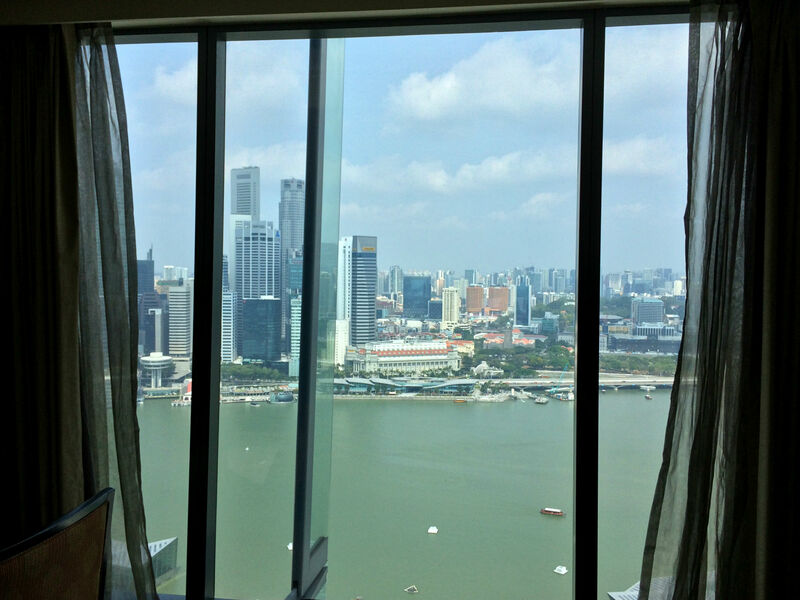 The last few days we admired Marina Bay Sands from the outside and now I can stand and look out from here. 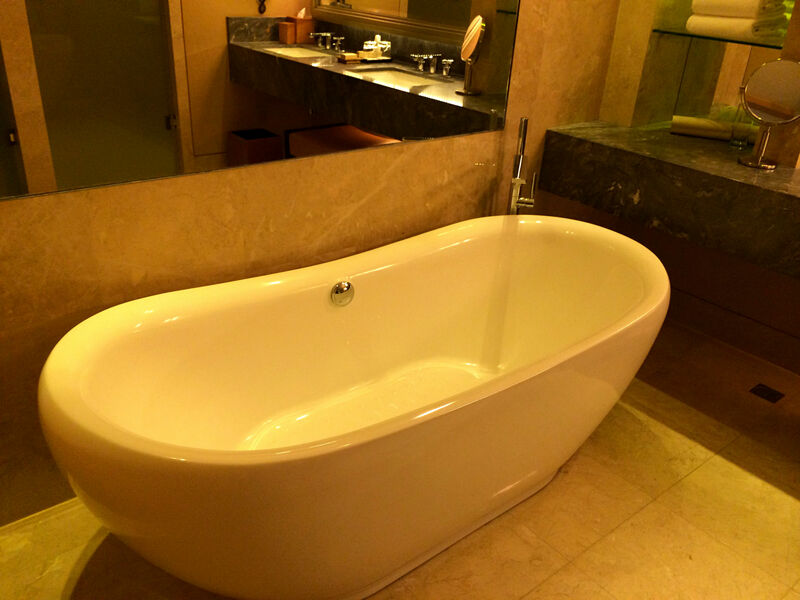 The huge bathroom with shower and freestanding bath is marble. 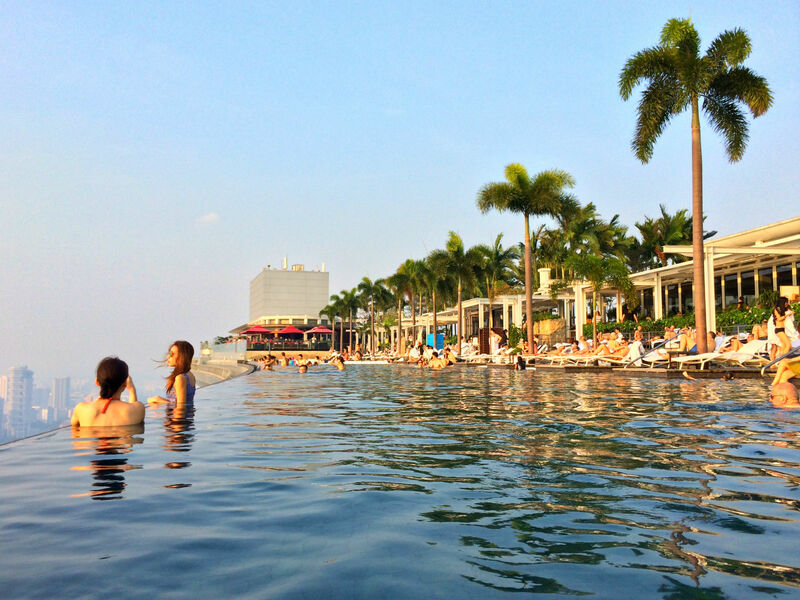 As nice as the room is, I want to go in the world-famous pool! 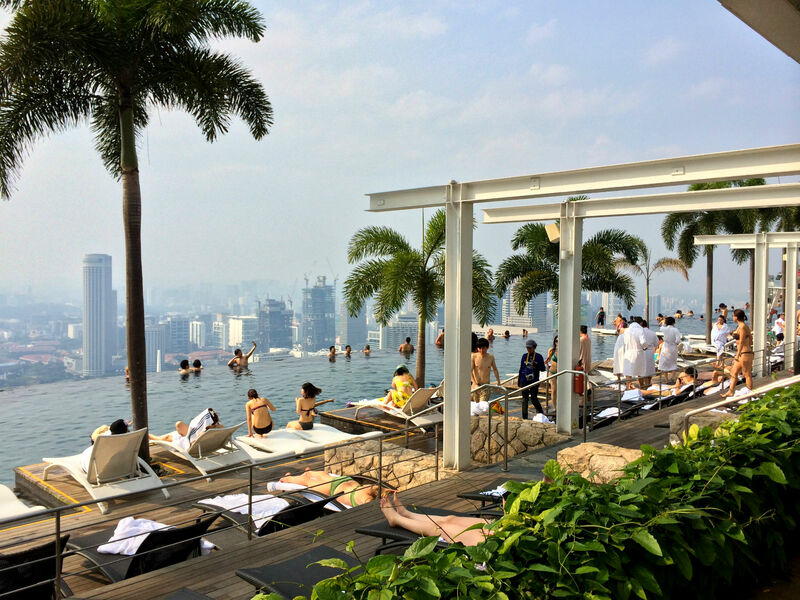 We have to go through two controls, to get to Skypark on the 57th floor, as the pool area is only accessible to hotel guests. 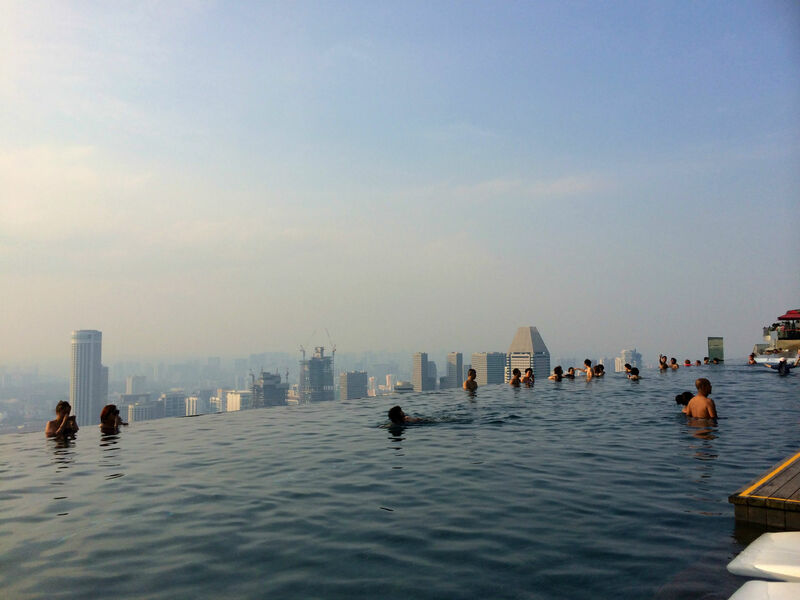 There it is: With 146 meters the longest, and at 200 meters the highest, Infinity pool in the world. Indeed the pool seems to have no boundary and that you would have to watch not swim too far. 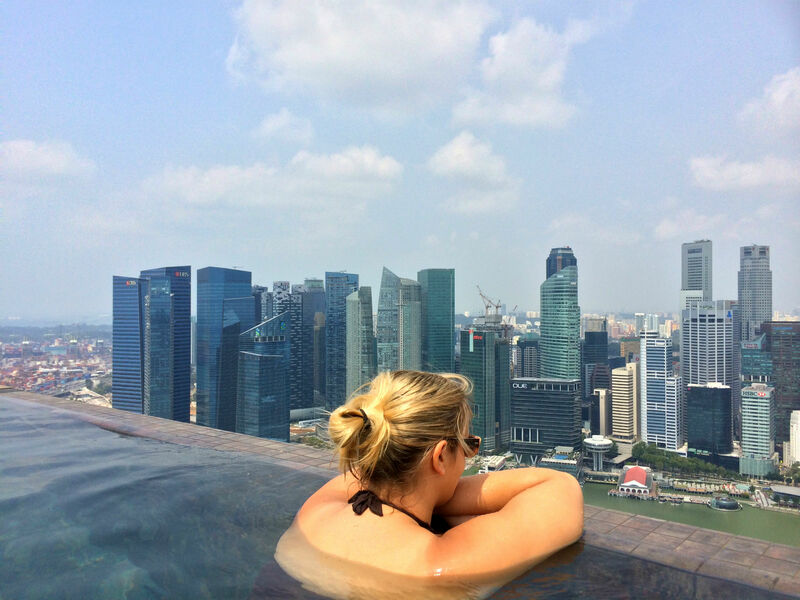 Also the view of Singapore’s skyline is simply amazing! 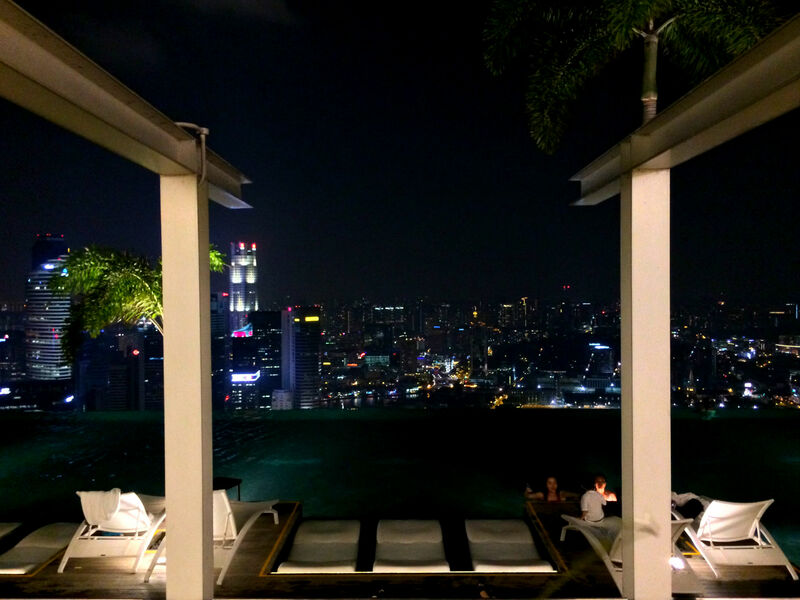 On the Skypark rooftop terrace, next to the infinity pool, are also restaurants, bars and an observation deck for visitors. 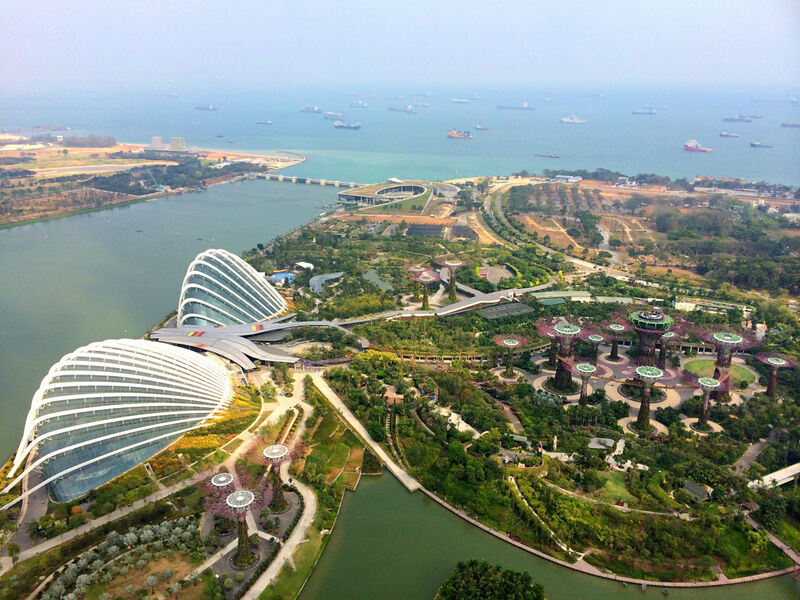 From here one also has a great all-round view, the Marina Bay, Singapore Flyer and Gardens by the Bay can be seen. To our chance, the grandstand for Formula 1 is currently being built. We find two sun chairs in the first row under palm trees and enjoy. 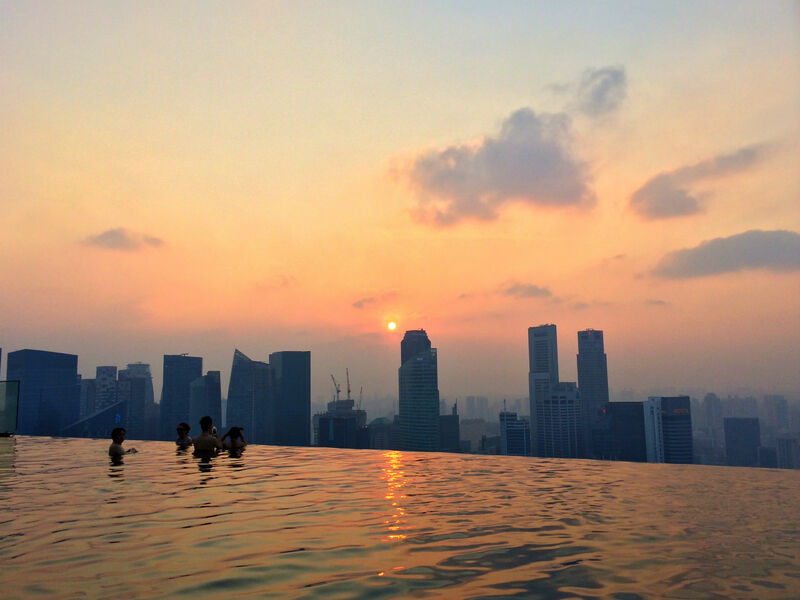 So we spend the rest of the day and watch as the sun slowly sets behind the skyscrapers. Even the next morning I cannot get enough. 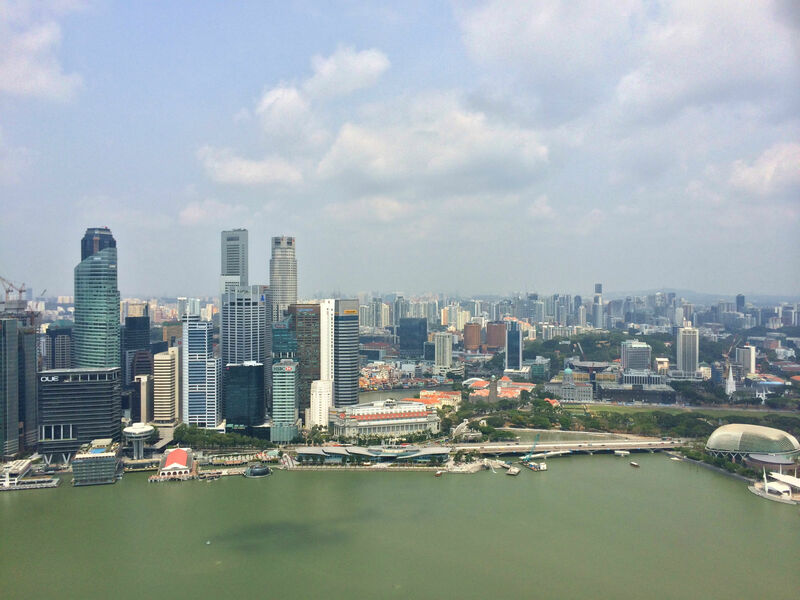 Over there – from up here quite small – somewhere is Merlion. 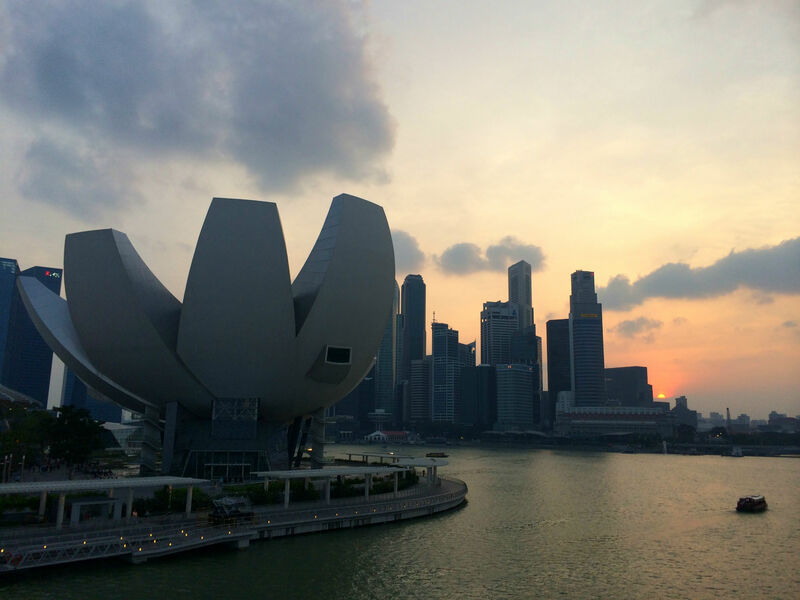 Half lion, half fish, a landmark of Singapore. 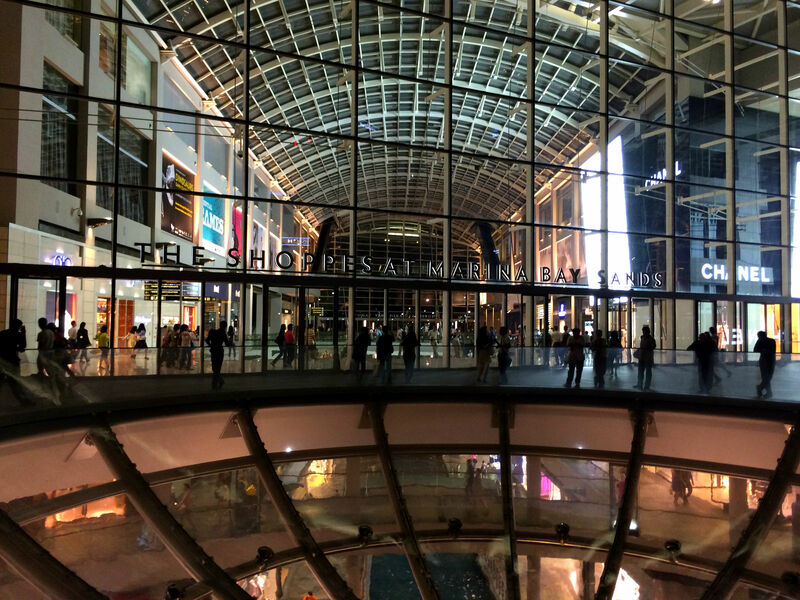 We can break away from the pool once more and go into the adjoining shopping mall “The Shoppes at Marina Bay Sands”. With ice-skating rink and a canal for gondola rides, it reminds me of Las Vegas. 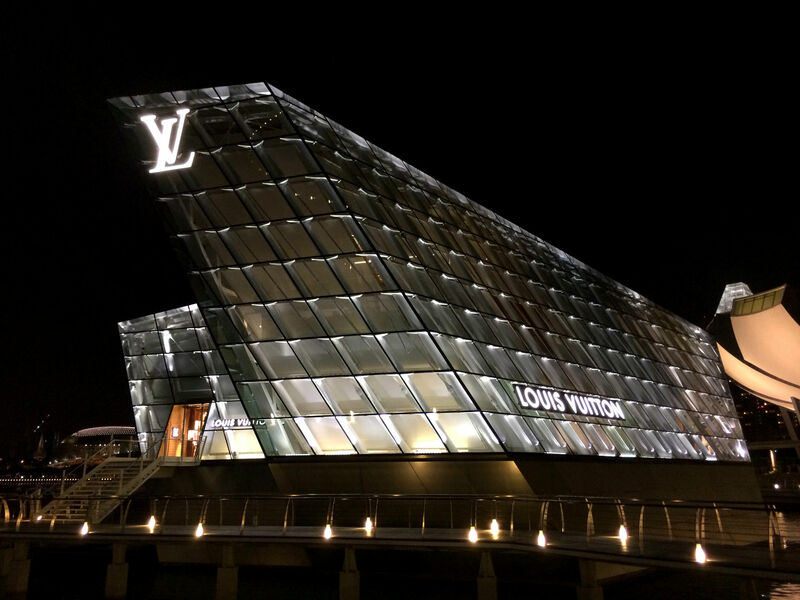 Outside the hotel, the Art Science Museum stands, in the form of a lotus flower and a huge Louis Vuitton store stands on its own island. 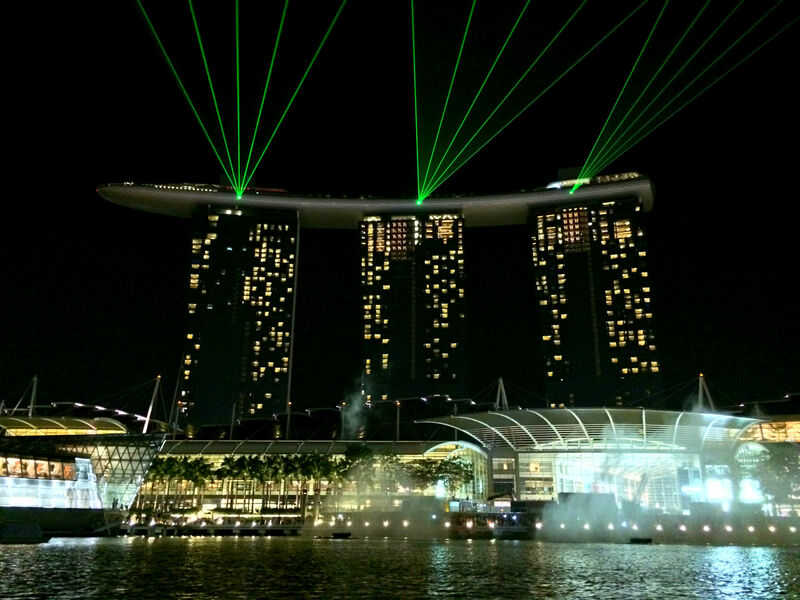 In the evening there is a light and water show in front of the hotel and of course, the laser beams that enchant the entire Marina Bay. Is it worth it? Absolutely! 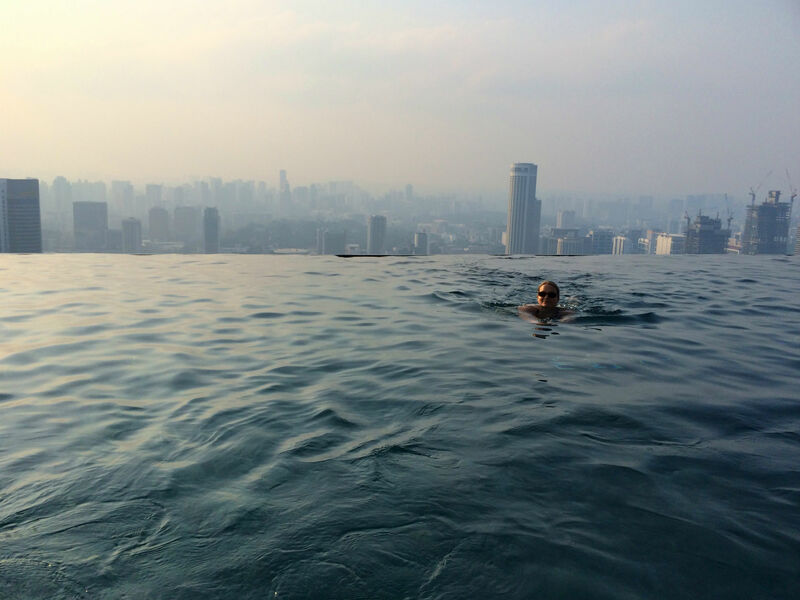 The Marina Bay Sands and the infinity pool are Singapore. 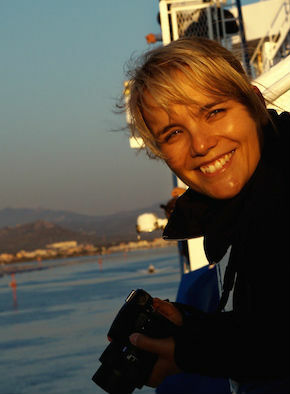 Do it like we did: Book a simple hotel to explore the city and treat yourself at the end of the trip for two nights, in which you fully savor the Hotel! This is really worth it! Another little tip: As our flight to Australia was only in the evening, we asked for a late checkout. Instead of 11:00 am we got to check out at 1:00 pm. From 11:00 am we had the pool almost completely to ourselves. 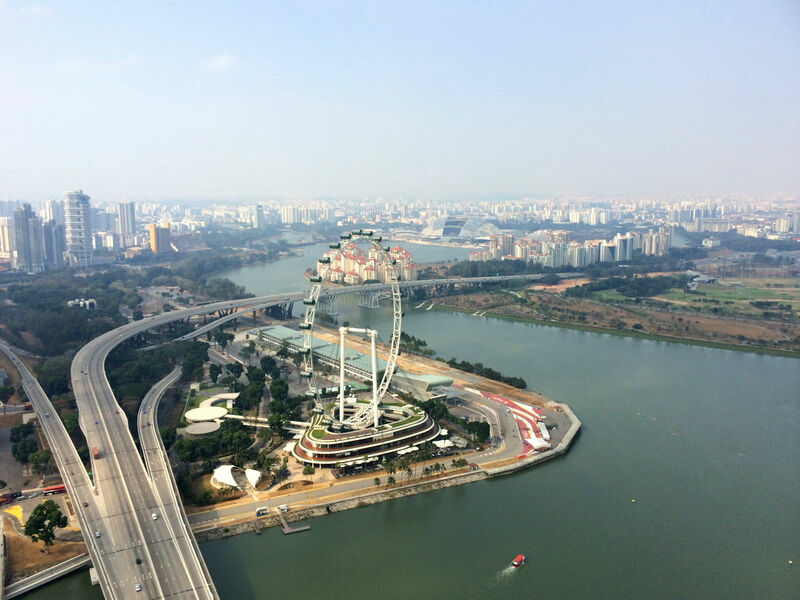 Visitors can also enjoy the view from 190 meters. 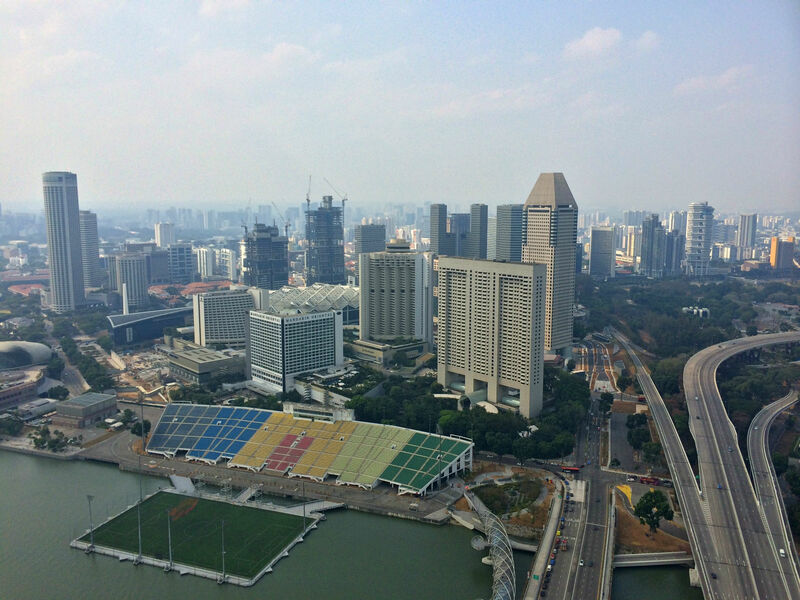 The Sands SkyPark Observation Deck is accessible to everyone. More information is available here.